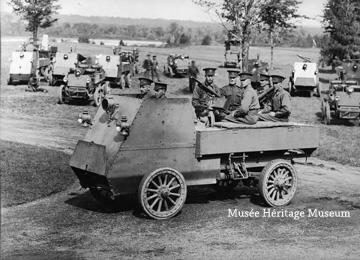 This photograph depicts an armoured vehicle from the 1st Automobile Machine Gun Brigade, which was commanded by Brutinel. The vehicle is manned by two drivers in the front and four gunners in the back. Several different vehicles are parked in the background. This photograph was taken by the Surveyor General's Office in Ottawa.